I'm trying to click on a Chrome extension ( Google Highlight : https://chrome.google.com/webstore/detail/multi-highlight/pfgfgjlejbbpfmcfjhdmikihihddeeji) then click on the text box and past my variables. set NoteforGoogleCHrome to "My text should be there"
click button 8 of toolbar 2 of window "myTab" of application process "Google Chrome" of application "System Events"
I tried this but this is most of the time failing. However if I do the same for CLICK 1 I have no error. The following works for me in macOS High Sierra 10.13.5 and Google Chrome 67.0.3396.99.
set NoteforGoogleCHrome to "click me"
As you can see in the image below, it highlighted all occurrences of click and me. Not the answer you're looking for? 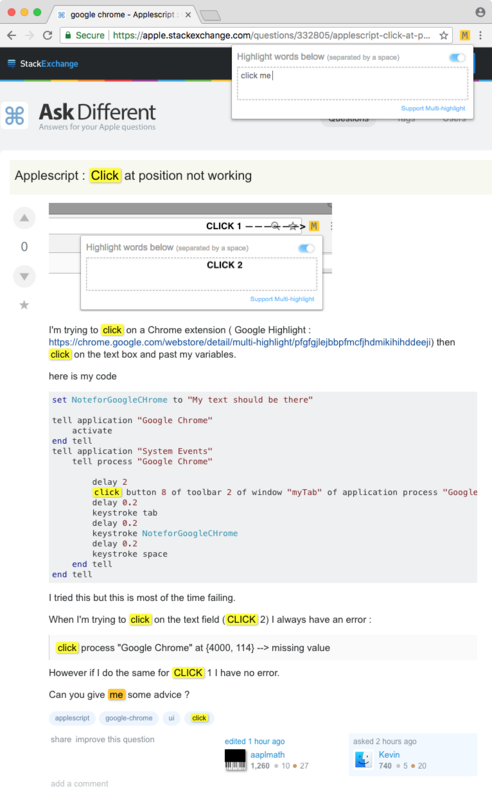 Browse other questions tagged applescript google-chrome ui click . How to debug slow Chrome on MacBook Air?